Well that seems fitting for a girl who just turned up on the side of the road. 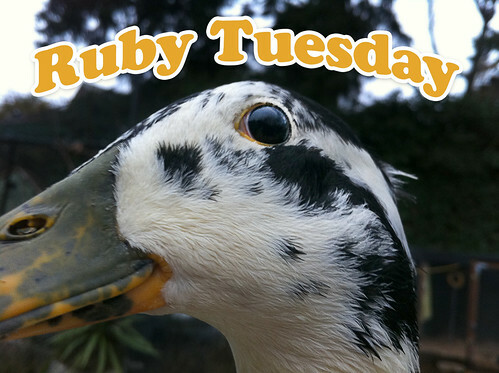 Please welcome our precious Ruby Tuesday. I’m pretty sure I’ll be calling her “Ruby Roobie Roo!” as a nickname. Also, she asked that you take note of her tiny little head crest near the back of her head. It’s cute and silly and precious, just like her. Here she is getting acquainted with Miles and Lionel this morning. Welcome to Ducks and Clucks, precious Ruby.